Ethel Mae Spencer, age 99, of Salisbury, MD and formerly of Gumboro, DE passed away in the care of Genesis HealthCare in Salisbury on Sunday, September 2, 2018. 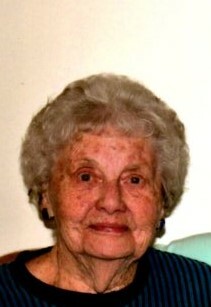 She was born on June 28, 1919 to the late Harvey W. Collins and Mary Hester Tyndall Collins in Millsboro, DE. Ethel held many jobs in her lifetime including owing her own country store with her husband in Gumboro DE, running a poultry and grain farm near Pittsville MD, working as a sales associate at Berger’s Ladies Shop in Salisbury MD, in addition to being a home maker. She lived on Mt. Hermon Road for many years prior to moving to Sterling Care Harbor Point, and attended Mt. Hermon UMC. Ethel was a “big time” member of McDonald’s Breakfast, Lunch and Dinner Club, where she entertained and played the harmonica. She was bubbly and happy all the time, and never met a stranger. She was married to the late Dyson Spencer, who preceded her in 1979. She is survived by two daughters: Gloria Davis (Russell) of Salisbury; and Patricia Marsheck (Bruce) of Ocean Pines, MD. She also is survived by a sister: Kathleen Bullock, and was preceded by sisters: Beatrice Lynch Campbell; Gladys Carey; and Lelia “Teenie” Donaway; and a brother: Elzey J. Collins. Additional survivors are her grand-children: Sherri Renee Davis; and Christopher Ryan Marsheck; and one great-grand-child: James Rocky Viniard. There are numerous nieces, nephews, cousins and extended family along with many friends. A funeral service and Celebration of Her Life will be held at the Watson Funeral Home in Millsboro on Sunday, September 9, 2018 at 2:00 PM with a viewing and visitation one hour prior, beginning at 1:00 PM. Rev. Milbourn Adkins, and Pastor Karen Sadvari will officiate. Interment follows at Millsboro Cemetery. Ethel loved flowers, and floral tributes are welcomed.